You are viewing a stunning English Victorian style 14 foot dining table and a matching set of 8 Gothic Chippendale chairs in mahogany. I hope the photos does this stunning set some justice – it really is better in the flesh. Eating together whether with family or friends is probably the most important thing we can do – so why not do it in total style and quality with a set that will last for generations? We appreciate it’s quite an initial outlay but this will last for centuries hence making it a great investment and family heirloom. It was hand made here in England to centuries old traditions and the quality is out of this world. The table is a Victorian extending diner that works by a winding mechanism at one end (please see close up photo). The table has four leaves each measuring 18 inches so there are numerous different combinations with this table. A leaf is an extra section of the table you can drop in. There are two D ends at either end of the table each measuring 4 feet. You could have just the two D ends together and the table would be round. Fully extended it is 14 feet long – and this would sit 12 people more than comfortably, perfect for large scale dinner parties and functions. The hand turned bulbous chunky balloon shaped legs are on castors so this table is easy to move around. There is even a leg under the middle of the table which makes it easy when you use the winding mechanism. The finish to the table is gorgeous, deep luxurious mahogany. The table is solid and sturdy, wobble free and comfortable to sit at. Then of course we have the matching set of eight Gothic Chippendale style chairs in mahogany. As is normal the set consists of two arm chairs and six side chairs. What can you say about the trusty Chippendale chair – they’re a design classic. In 1754 the Englishman Thomas Chippendale published The Gentleman and Cabinet Maker’s Director by subscription. This was a book of engraved designs for a wide variety of household furniture in the fashionable styles of the time, including the Rococo, Chinese, and Gothic tastes. Chippedale chairs such as these were perhaps the most popular design used in the book. 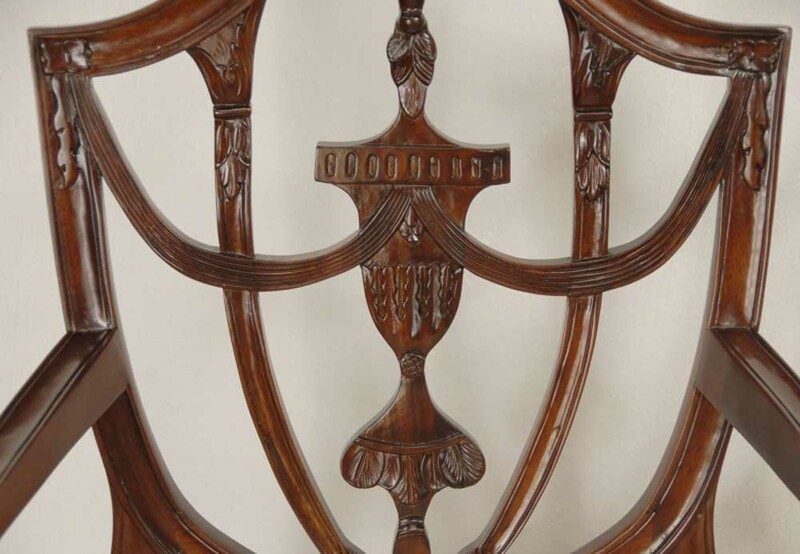 Typical Chippendale motifs include the ball and claw feet, the cabriole legs with carved motifs and the elegant backsplat with more hand carved interlaced designs and Gothic references. The seats have just been reupholstered and are hence free from any previous owners smells such as smoke and pets. These chairs are so comfortable to sit in. Solid and wobble free, the joints are very tight. They match the table perfectly and this is a dining set fit for a king and a Queen. We bought this set from a dealer in Sheringham and we will ship it to anywhere in the world. It can be viewed in our Hertfordshire warehouse. It is ready for home use right away – act fast, this unique set won’t be hanging around for long. If you want other dining chairs to match this table we have them – Queen Anne, George III, Trafalgar, Regency other styles of Chippendale – so please ask. 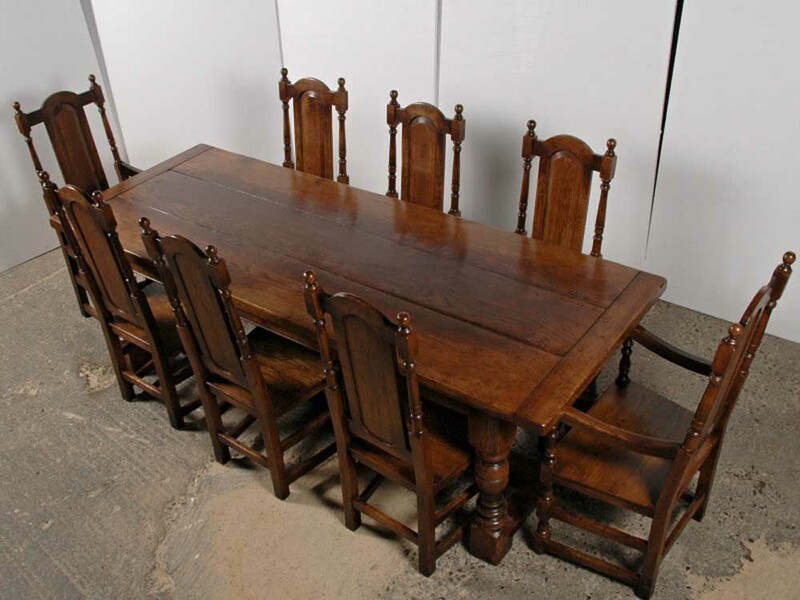 You are viewing a gorgeous English Chippendale style Victorian dining table in mahogany with a matching set of 8 Chippendale Gothic dining chairs. 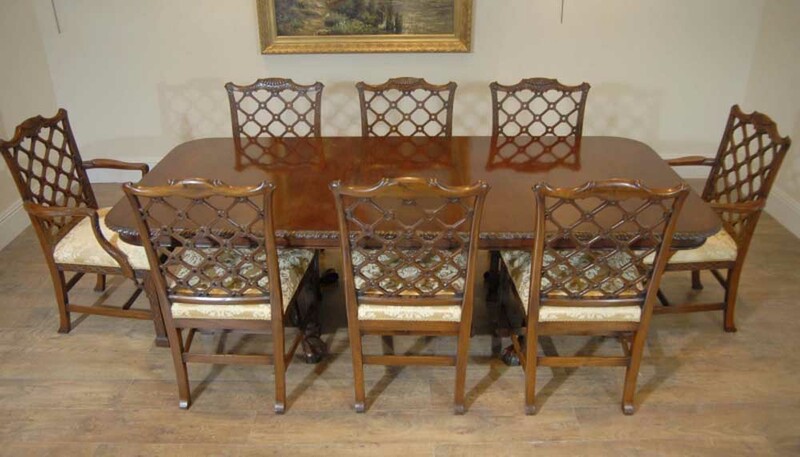 A Chippendale dining set – what a result! The table features the distinctive ball and claw feet which are hand carved and very detailed. To the perimeter of the table top is further hand carved detail in the form of egg and dart banding. The table features one leaf which measures 22 inches so there are a number of different size combinations. The table is offered in great shape, solid and sturdy, wobble free. The chairs are 8 Chinese Chippendale Gothic dining chairs. They have a lovely Gothic look with the hand carved backspat – there are further carved details on the legs and arm rests. You can only imagine the time to craft these and they are in the Chippendale manner, solid and chunky with no wobbles. These wouldn\’t look out of place at the Royal Pavilion in Brighton, which contains perhaps some of the best Chinese Chippendale pieces courtesy of the Prince Regent. The chairs are solid and sturdy and come as a set with two arm chairs and six side chairs. They come with white upholstered cushioned seats with a gothic print. The seats have new fabric so are free from previous owners smells such as pets and smoke. I do hope the photos do this stunning set some justice, they\’re certainly better in the flesh. We were lucky enough to come across the table and chairs at a dealers in Debenham, Suffolk. Both table and chairs are offered in perfect condition ready for home use right away and we will ship to anywhere in the world. We will also sell the chairs or table separately if you are interested so please email for more details. Happy bidding, these won\’t be hanging around for long.